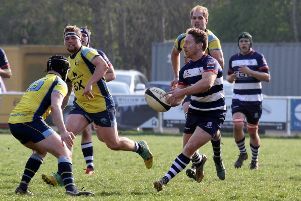 Brackley ended their Midlands Four East South campaign on a high note as they scored 11 tries in a 69-10 rout of Thorney on Saturday. With fourth spot already secured, Brackley came into their final game looking to end the season on a positive note and entertain the home ground in ideal conditions. It didn’t take long for the hosts to get on a score sheet when a good run from flanker Josh Millar was followed by some excellent off-loading before wing Gareth Rees dotted down. Moments later a strong run straight from the kick off by Mark Downey led to full back Seb Johnson scoring in the left hand corner to double Brackley’s lead. While Thorney had their moments and managed to break the Brackley defence to score two tries of their own, it was the hosts who were dominant for much of the game showing not only some strong running but great off-loading and support play throughout. By the end of the game Brackley had scored 11 tries with Johnson getting a hat-trick in his last game for the club, a feat matched by the impressive Dennis Franklin. Graeme Cartmell got a brace while Chris Goodall and Phil Brinklow got the other two tries to give Brackley a dominant 69-10 win. It was a great way to end the season in front of a packed home crowd, along with a couple of players retiring and going on to pastures new, it was a perfect send off. It has been a much improved season for Brackley who have played some brilliant rugby throughout and shown not only how strong the squad has become but how hard everyone works to keep their spot in the team.